Paged media (e.g., paper, transparencies, pages that are displayed on computer screens, etc.) differ from continuous media in that the content of the document is split into one or more discrete pages. 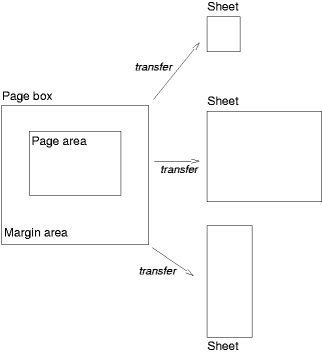 To handle pages, CSS 2.1 describes how page margins are set on page boxes, and how page breaks are declared. The page area. The page area includes the boxes laid out on that page. The edges of the first page area establish the rectangle that is the initial containing block of the document. The size of a page box cannot be specified in CSS 2.1. Authors can specify the margins of a page box inside an @page rule. An @page rule consists of the keyword "@page", followed by an optional page selector, followed by a block of declarations. The declarations in an @page rule are said to be in the page context. The page context has no notion of fonts, so 'em' and 'ex' units are not allowed. Percentage values on the margin properties are relative to the dimensions of the page box; for left and right margins, they refer to the width of the page box while for top and bottom margins, they refer to the height of the page box. All other units associated with the respective CSS 2.1 properties are allowed. Rotate the page box 90ï¿½ if this will make the page box fit. If different declarations have been given for left and right pages, the user agent must honor these declarations even if the user agent does not transfer the page boxes to left and right sheets (e.g., a printer that only prints single-sided). User Agents must apply these properties to block-level elements in the normal flow of the root element. User agents may also apply these properties to other elements, e.g., 'table-row' elements. When a page break splits a box, the box's margins, borders, and padding have no visual effect where the split occurs. In the vertical margin between block boxes. When a page break occurs here, the used values of the relevant 'margin-top' and 'margin-bottom' properties are set to '0'. If the above doesn't provide enough break points to keep content from overflowing the page boxes, then rules A, B and D are dropped in order to find additional breakpoints. Declarations in the page context obey the cascade just like normal CSS declarations.